In many-light rendering, a variety of visual and illumination effects, including anti-aliasing, depth of field, volumetric scattering, and subsurface scattering, are combined to create a number of virtual point lights (VPLs). This is done in order to simplify computation of the resulting illumination. Naive approaches that sum the direct illumination from many VPLs are computationally expensive; scalable methods can be computed more efficiently by clustering VPLs, and then estimating their sum by sampling a small number of VPLs. Although significant speed-up has been achieved using scalable methods, clustering leads to uncontrollable errors, resulting in noise in the rendered images. 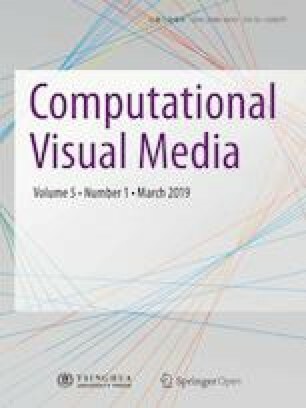 In this paper, we propose a method to improve the estimation accuracy of many-light rendering involving such visual and illumination effects. We demonstrate that our method can improve the estimation accuracy by a factor of 2.3 over the previous method. Hirokazu Sakai received his B.S. degree from Wakayama University in 2017. He is currently an M.S. student at Wakayama University. Kosuke Nabata received his B.S. and M.S. degrees from Wakayama University in 2013 and 2015, respectively. He is currently a Ph.D. student at Wakayama University. Shinya Yasuaki received his B.S. and M.S. degrees from Wakayama University in 2015 and 2017, respectively. He is currently working at Square Enix Co., Ltd.
Kei Iwasaki received his B.S., M.S., and Ph.D. degrees from the University of Tokyo, in 1999, 2001, and 2004, respectively. He is currently an associate professor at Wakayama University. This work was partially supported by JSPS KAKENHI 15H05924 and 18H03348. The images or other third party material in this article are included in the article’s Creative Commons licence, unless indicated otherwise in a credit line to the material. If material is not included in the articles Creative Commons licence and your intended use is not permitted by statutory regulation or exceeds the permitted use, you will need to obtain permission directly from the copyright holder. Other papers from this open access journal are available free of charge from http://www.springer.com/journal/41095. To submit a manuscript, please go to https://www.editorialmanager.com/cvmj.